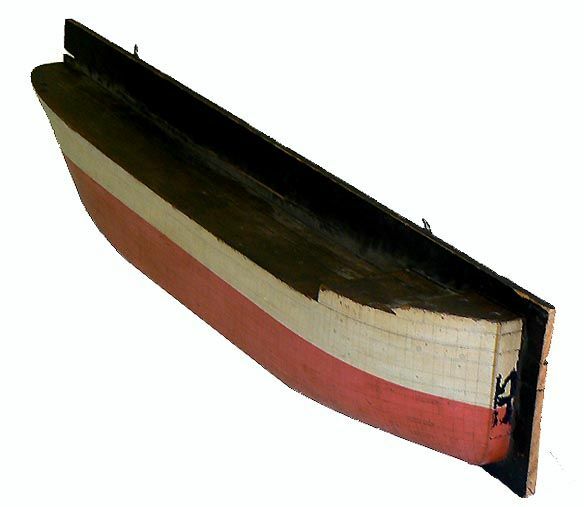 To view our current inventory of vintage and antique half hull models, click here! 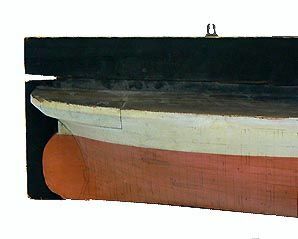 Presented is a massive antique builder's half hull model, 63 inches wide, that was made to lay out the steel or iron plates to skin the hull of a cargo ship. She has no identifying marks other than the individual hull plates inscribed on her side. Her name and builder are unknown. However, the vessel's lines with her plumb bow and fantail counter stern dates the vessel as being built around the last quarter of the 19th Century. The hull is built from what appears to be six lifts of knot free wood, and is mounted on a heavy wood backboard, also of one piece which is 1 inch thick. Combined they weigh 40 pounds. PLATING SEQUENCE: Not counting the extra long stern section there are 123 scribed stations along the keel 1/2 inch apart, and 11 ceilings from "A" through"K". Many plates are marked “in/“out“. There are other notations meaningful to the naval architect and plating foreman. CONDITION: The half hull shows the hand work of carefully inked vertical and horizontal lines along the entire hull. There is a "old" chip of wood missing at the forecastle. There are a couple of very small chips of wood missing at deck level which show as "old" and a piece missing from the backboard at the point of a split which runs half its length. The split has been braced using metal straps in three places and is stationary. Elsewhere, on the hull there are some minor abrasions which blend into its look of age. There is paint missing at the bow. The exterior of the hull has inked lines, over a Grey undercoat. It has an appealing warm old patina. The deck is painted black as is the backboard. 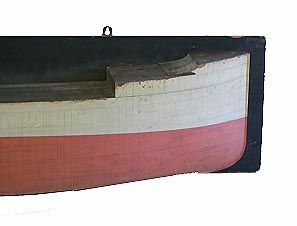 The bottom of the hull is a rose color which is common on British made models at the “Turn of the 19th Century”. The backboard has two brass mounting brackets. Buy this rare and unique plating half hull model now! What a great gift for a person who has everything! What a great conversation piece. What an interesting addition to your office, den or board room. SHIPPING CAN BE ARRANGED by the buyer through LDG Delivery Service for the U.S. East Coast, and certain cities in Michigan, and Indiana, and periodic trips to California. Contact L. Drew Gerard, for quotes. 561-212-7159, Email: antiquedelivery@aol.com For Canadian and overseas shipment contact your local freight forwarding company for quotes. If you wish us to pack and ship the item to a continental U.S. address, you will have to agree to hold us harmless for any damages or loss in shipment. Buy this very special relic of maritime history Now! What a great find for that special person who can appreciate and afford only the finest.